Ever tried to find the common things between two people, similarity, differences etc.? Today, I am going to share PersonalityMatch mobile app which helps to discover the secret to getting along with anyone in your life! This fermium mobile app is currently in trend and helps the user to find the similarity, matches with anyone. The other person can be your relative, family member or the life partner. You would be able to know the likes and dislikes of the other person and based on it, you may try to adjust with him/her. 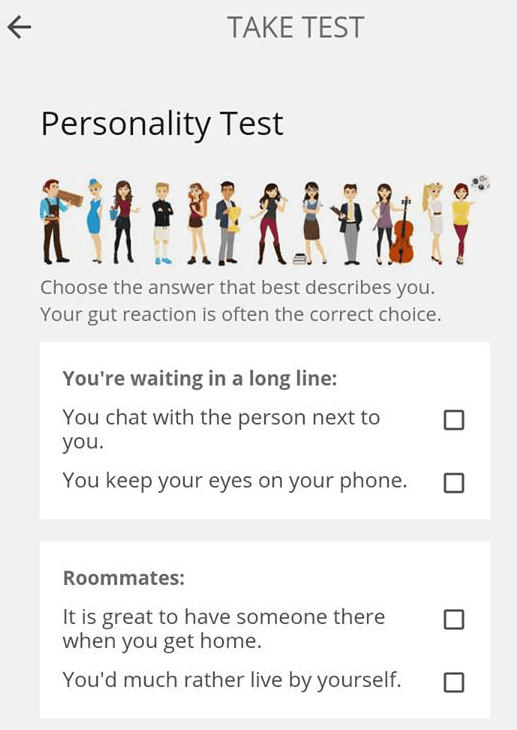 PersonalityMatch mobile app uses some multiple choice questions and based on the answers, it will show you the matches, likes, and dislikes. 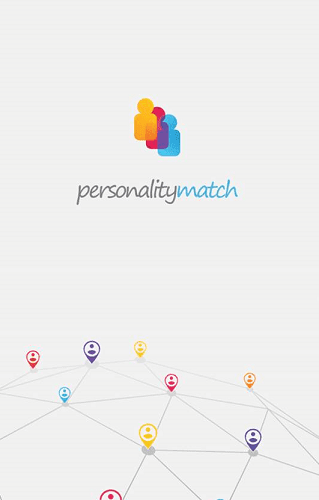 PersonalityMatch is a fermium mobile app available for both Android and IOS. You can download the app for free from the respective stores. A product by PersonalityPerfect, this PersonalityMatch has been downloaded around 50k times from Google Play Store with an average rating of 4.3 based on the feedback shared by around 700 users. The premium version of the app is also available with some more features and cost just around $1-$5. 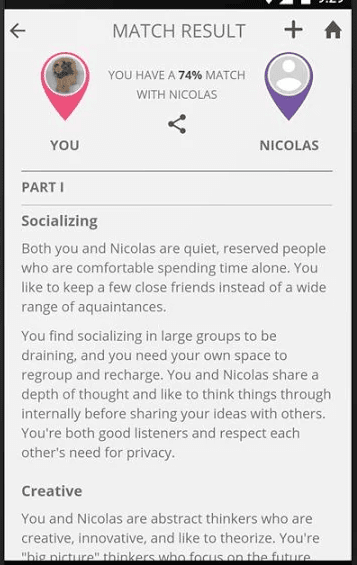 It is an excellent app to find & match your personality type with your partner or friends and discover easy ways to boost your relationships. There are multiple features this app possess and let me discuss few of those here. There are multiple features of this app. Let me share the summarize version of the app here. This personality matching application through which users can find out their compatibility score with their partner or friends. Users can also get some common problems and based on the tips and solutions suggested by the app, they can come to the solution and find a better relationship. It also helps the user to understand and weakness of their partner and motivate to overcome the weakness. The working of PersonalityPerfect mobile app is pretty simple and interactive. It uses the machine algorithms to find the matches, likes, and dislikes. Just like any other app, you will have to download it from the respective store. Once downloaded, install the app and open it. Here you will have to register. The registration process has been made easy by providing the sign-up options with social media. Once registered, you are good to go ahead and explore the amazing app. After successful registration, users will be able to see the below screen. Here either you can go through the personality test which will have around 30 MCQs or you can invite someone with which you can go for personality test. 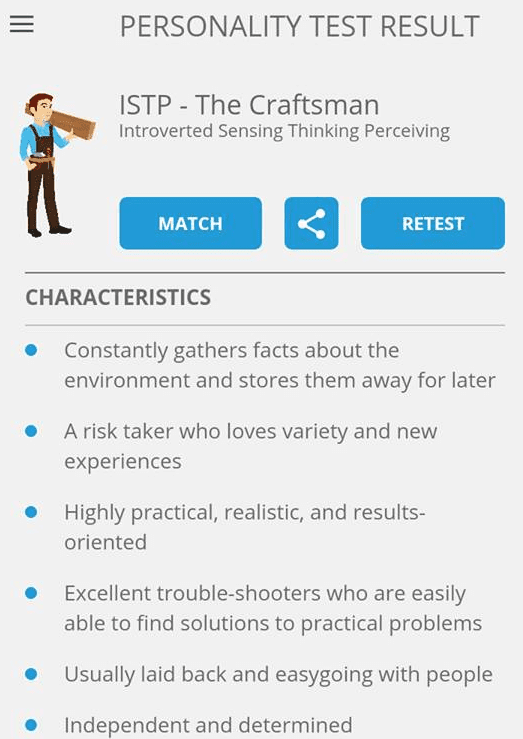 If you are using the app for the first time then you will have to go through the personality test like below. And much more with few radio buttons for the answers. You will have to select one of the radio button corresponding to each question. Based on the answers you will provide, the system will show you the characteristics and other details. After taking the test, you will have the summary screen like below. It will show you the characteristics and other details related to your personality. 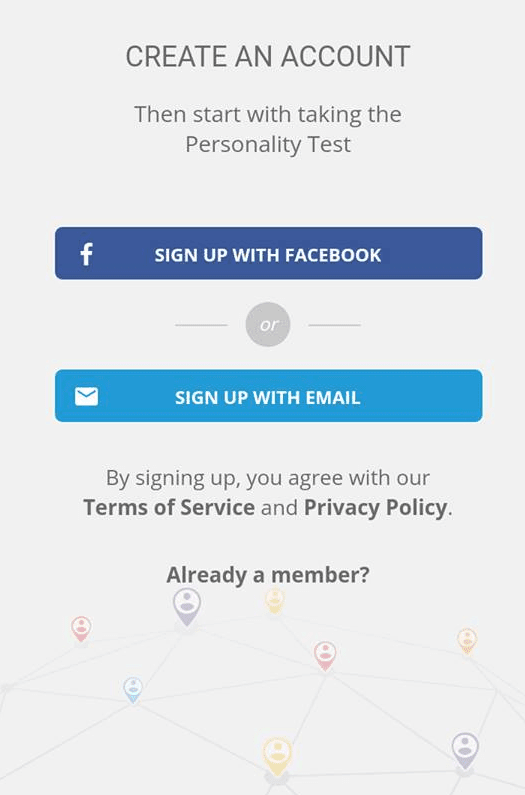 Now you can partner or friend to give the same test to find out their compatibility. Once you have taken the personality match with someone, it will show you the summary. 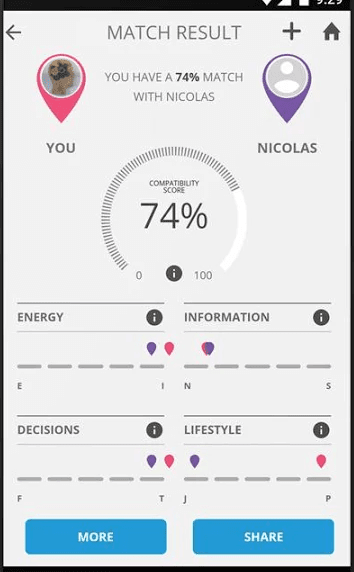 The app will also show you the personality match with the other person. You can also find the details of the match based on the categories like lifestyle, energy etc. 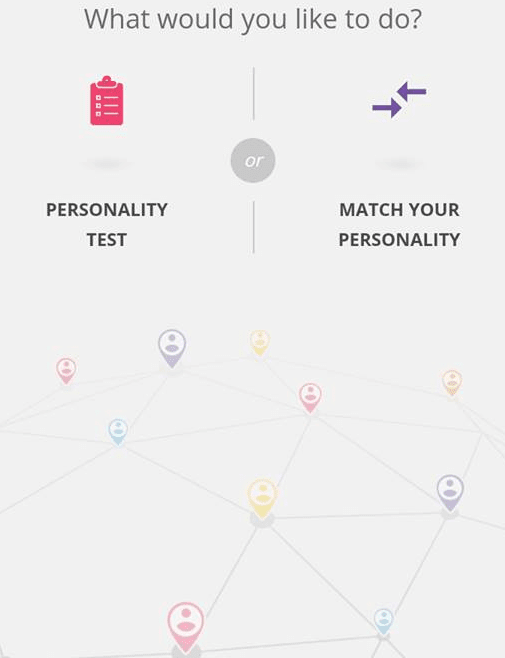 PersonalityMatch is a unique kind of mobile app for personality matching with your friends, relatives, and partners. You would be able to know the likes, dislikes and the common things with your partners. It is also a great tool for finding your ultimate career path! The built-in personality test works as a career test or job test too. Just take the test, find your personality type and then discover the best and worst careers for your type.